Eldest son of Dr A.E. Naish. Education: Dragon School, Oxford; RN Colleges, Osborne and Darmouth; RN Engineering College, Keyham. Taught science and math at a grammar school. Inventor of the Heads Up Display, which relays flight data to pilots by projecting information about air speed and angle of attack onto a semitransparent screen. His invention revolutionized modern aviation and is installed in aircraft worldwide and in the space shuttle. Came to the U.S. in 1965 to work in the aircraft industry. He moved to Santa Fe in 1984. Elder son of Col. Sir Joseph Nall, 1st Bt (1887-1958), and Edith Elizabeth Francklin. KCB, KBE, MVO, DFC; two sons. General Manager, Guide Dogs for the Blind Association, 1961-1964. Appeal Commissioner, Inland Revenue, 1981-1996. President, Nottingham Chamber of Commerce and Industry, 1972-1974. DL Notts, 1970; High Sheriff, Notts, 1971. Vice Lord-Lieutenant of Nottinghamshire, 1989-1991. Chairman: Notts Scout Assoc., 1968-1988 (Silver Acorn, 1979; Silver Wolf, 1989); Papplewick Pumping Station Trust, 1974-. Married 1st ((06? ).1921, St Martin district, London; marriage dissolved) Nora Creina Christian, daughter of Owen S. Christian, of Port Elizabeth, South Africa. Married 2nd (27.06.1930; marriage dissolved) Florence Silvia Jack, of Simonstown, South Africa; one daughter. Florence Napier remarried C. Tizzard, of Cape Town. * For distinguished services in command of H.M. Coastal Motor Boat 24A in the attack on Kronstadt Harbour on the 18th August, 1919. Son of ... Napier, and ... Gilchrist. Married 1st (1944) Eve Lindsay (divorced 1975); two sons, one daughter. Married 2nd (1975) Delia Conway. minelaying & passages to Malta &tc. An accomplished artist & cricketer. Son of Adm. William Rawdon Napier, CB, CMG, DSO (1877-1951). Son of Francis Edward Basil Napier, 12th Lord Napier and Ettrick (1876-1941), and Hon. Clarice Jessie Evelyn Hamilton (died 1951). Married 1st (01.05.1937) Catherine Eileen Thorne (died 18.01.1965). Married 2nd (06.06.1967) Helen Catherine Sanderson. Married ((12? ).1919, Westhampnett district, Sussex) Dorothy Florence "Dolly" Leggett (25.04.1896 - 30.08.1981), daughter of Joseph Leggett (1853-1922), and Amy Ogburn (1856-1945); ... children (one son?). Son (with one brother and one sister) of William Ernest Napper (1883-1974), and Amie Muriel Dorothy Read (1885-1959). Married (01.11.1945, Belhaven Church, Hillhead district, Glasgow, Scotland) Isobel Cowie (1922 - 01.01.2012); four sons. Education: RN College, Dartmouth (01.05.1936-1939; Hawke House; Admiralty No. 1665). Son of Cdr. Walter Macdonald Nash, OBE, RN (1885-1952), and Dorothea Hoskyns (1888-1982). * Special promotion "for distinguished service in action". Married ((06? ).1915, Brentford district, Middlesex) Dorothy "Dolly" Tucker (07.02.1889 - (03? ).1971); two daughters (Patricia married firstly Cdr. (E) Barry Warsop Cooper Leonard, RN (1911-1944), secondly Lt.Cdr. (A) William Francis Cuthbert Garthwaite, DSC and Bar, RNVR, thirdly Samuel Carson Fitzwilliam Allen, who served in the ranks in the RAF; Dioné married Lt.Cdr. Richard Frederick Colvile, MBE, DSC, RN). Elder son Eric Gilbert Sudlow Nelson (1887-1979), and Mrs Nelson, of Santos, Brazil. Married (1959/60?) Barbara Lumsden Miller, younger daughter of Colin McLaren Miller (1889-), of Sunnyhill, Eastbourne (late of Ceylon), and Winifred P. Lindsay; six sons. 1924 ? Son of Alexander and Elizabeth Nesbitt. Husband of Etheldreda Mary Nesbitt (née Coolican), of Chislehurst, Kent. Only son of Capt. Cecil Reginald Adey Newby, RNR (1868-1933), and Ethel Gertrude Emily Wood (1875?-1955), of Hove, Sussex. Married 1st (17.11.1934, Church of St. Mary the Crowned, Gibraltar; marriage dissolved 14.02.1950) Hilda Hodgkinson Butterfield (01.02.1908 - 19.04.2001), second daughter of William Arthur Butterfield (1873-1943), and Rebecca Emelda Stevenson (1880-1953), of Hong Kong. Hilda Newby remarried (20.07.1950, Marylebone Register Office, London) Brig. Arthur Kingscote Potter, Army in Burma Reserve of Officers (1905-1998). Married 2nd ((06? ).1950, Westminster district, London) Irena Dunollie (formerly Mrs George E.C. Rossall, née Moore) (14.07.1908 - 01.1985). Son of George Ernest Newill (1859-1933), and Lucy Eliza Phillips (1859-1933), of Stoneygate, Leicester. Married ((12? ).1920, Kensington district, London) Rosina Marjorie "Madge" Bell (06.01.1894 - 17.08.1964); one daughter. * For the great skill and gallantry displayed by him in handling his ship in the presence of a greatly superior enemy force and under heavy fire. He performed most efficiently his main duty of shadowing the enemy and reporting his movements. He proceeded into the minefield to engage a superior force of enemy destroyers and drove them back to their base. He again entered the minefield at great risk to his ship, and gallantly rescued 162 survivors of the "Breslau" whilst still being fired on from shore batteries. died between 08.1989 and 12.1991 ?? Married; .. children (one of which is Capt. Peter Dale Nichol, RN). Son of Capt. Henley Dale Nichol, RN. Son of Francis Henry and Grace Loveday Nicholas. Husband of Emmie Nicholas, of Bideford. Sixth son of William Nicholl, FRAM (?-1901), of London. Married (1922) Winifred Rose Edkins, daughter of G.T. Edkins, of Hong Kong; one son, one daughter (and one daughter deceased). Education: Brighton College (Christmas term 1911-Summer term 1914). Defence Correspondent, BBC External services, 1951-1966. Married (post-war) Elizabeth Agnes Hallowes (born 1916); ... children (one daughter?). Son of Gen. Sir Lothian Nicholson and Hon. Lady Mary Nicholson, daughter of 1st Baron Romilly. Had three sisters and six brothers; three of them made it to Maj.Gen. [Cecil, 1865-1933; Octavius, 1877-1938; Francis, 1884-1953] and one to Adm. [Douglas, 1867-1946]. Married (10.1915) Evelyn, 5th daughter of Maj.-Gen. Andrew Smythe Montague Browne, Col Royal Scots Greys. Son of Maj. Thomas McCallum Nicholson (1877-1924), and Jessie Elizabeth Blair Hitchman (1871-1907). Married ((03? ).1935, Westminster district, London) Adele Myldred Allen, daughter of William Grover Allen (1855-1931), and Mrs Allen, of Canford Cliffs, Bournemouth; one daughter, one son. Son of William Lambton Nicholson and Adamina Eliza Nicholson. Husband of Kathleen Mary Nicholson, of Meopham. Son of W. Gresham Nicholson. Married Cicely Georgina, CStJ, daughter of the late Rev. Sub-Dean H. Mackworth Drake; one son, one daughter. Lieutenant-Governor and Commander-in-Chief of the Island of Jersey, 16.10.1953-1958. Son of Col. Bernard Underwood Nicolay, CB (1873-1960), and Alice Gertrude Braddon (1879-1962), of The Cobbles, Windlesham, Surrey, later of Camberley. Married ((09? ).1933, Weare Giffard, Torrington district, Devon) Sheila Doris Graham, only daughter of Lt.Col. C.P. Graham, CBE, DSO, of The Hill, Weare Giffard, Devon; one son, one daughter. Education: RN College, Osborne (15.09.1920). Son of the Revd. Hayden F. Nixon and of Maud A. Nixon (nee Braydon); husband of Sylvia Rosetta Nixon, of Crowthorne. Son of Colonel Charles Simon Noble. Married 1st, Diamantina (died 1909), only daughter of Allan Campbell. Married 2nd (18.02.1913) Celia Emily, only daughter of Robert Kirkman Hodgson and Lady Norah Hodgson. Son of Gambier Baptist Edward Noel (1888-1957), and Beatrice Eva Tytler Byng (1893-1966). Third son of Capt. Stanley Bernard Norfolk, RN, and Mary Carmen Galliano, of Dover. Brother of Capt, Stanley Edward Norfolk, RN, Lt.Cdr. Robert Galliano Norfolk, DSO, RN, and Lt. Bernard Aloysius Norfolk. Territorial Army. Married (12.02.1941, Scotland) Mary Joan Matthews, elder daughter of late Adolphus Matthews, of Chignal Smealey, Essex; no children. Education: St. George's College, Weybridge; RN Colleges Osborne (15.01.1921-...) & Dartmouth. Joined Staff of McKinsey & Co. Inc., Management Consultants, 1960. Younger Brother of Trinity House. Youngest son of Capt. Stanley Bernard Norfolk, RN, and Mary Carmen Galliano (from Gibraltar), of Dover. Brother of Capt. Stanley Edward Norfolk, RN, R.Adm. George Anthony Francis Norfolk, CB, DSO, RN, and Lt. Bernard Aloysius Norfolk, Territorial Army. Married (20.06.1940, St andrew's Cathedral, Dundee) Margaret Mary Collingridge, of Wimbledon, Surrey; one daughter. Education: RN College, Dartmouth (05.1923-12.1926; gained Robert Roxburgh Prize, and French & English prizes). Eldest son of Capt. Stanley Bernard Norfolk, RN, and Mary Carmen Galliano (from Gibraltar), of Dover. Brother of R.Adm. George Anthony Francis Norfolk, CB, DSO, RN, Lt.Cdr. Robert Galliano Norfolk, DSO, RN, and Lt. Bernard Aloysius Norfolk. Territorial Army. Married (06.12.1924, St Mary's, Holly Place, Hampstead, Middlesex) Enid Margaret "Peggy" Powell, youngest daughter of Mr & Mrs Alfred S. Powell, of Torquay; ... children (two sons, two daughters?). Education: Conway; RN College, Dartmouth (01.1913-...). Son of James Thomas Norfolk, and Emma Kay. Married (18.06.1917, William Street Methodist Chapel, Greenwich) Grace Harriett Hunt, daughter of Henry James Hunt. Son of Alfred Headley Norman, naval officer retired. Married (28.04.1934, Malta) Aileen Lucy Southwell Piper, daughter of Frederick Southwell Piper, naval officer retired. * Lieutenant E.D. 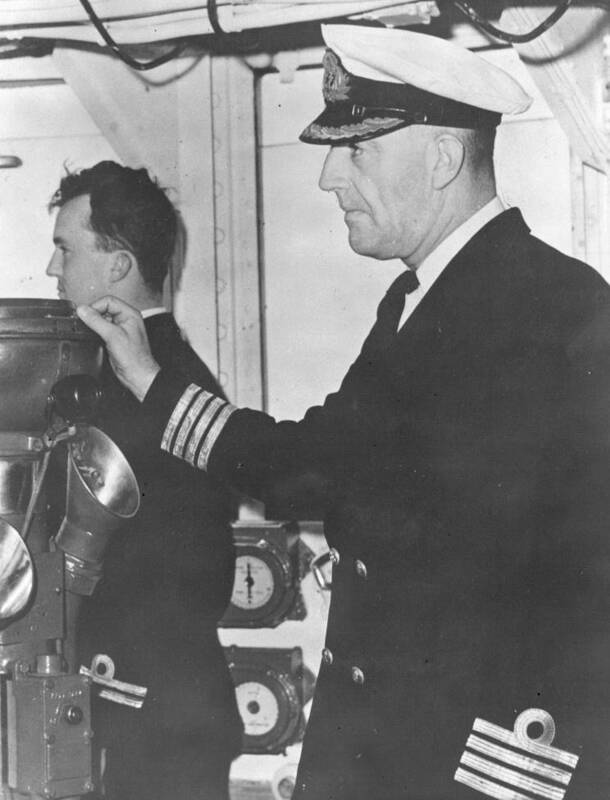 Norman was in command of H.M.S. "UPRIGHT" on war patrol in the Central Mediterranean between 19th and 26th February 1941. During the middle watch on 23rd February "UPRIGHT" located and sank by Torpedo a darkened and zigzagging enemy vessel carrying petrol to forces in Tripolitania, and during the middle watch on the 25th February he attacked and sank by Torpedo an enemy cruiser, escorted by two other enemy warships. Only twelve minutes elapsed between sighting this fast and powerful enemy ship and firing the torpedoes which sank it. The difficulties overcome in these two successive attacks carried out on dark nights exemplify the efficiency and alertness of his command and Lieutenant Norman’s personal determination and skill. Son of Lt.Col. Henry Lawrence Weekes Norrington, RAMC (1872-1950), and his 2nd wife Ethel Victoria May Toppin (c. 1876-?). Education: RN Colleges, Osborne (16.01.1914-14.01.1916) & Dartmouth (15.01.1916-01.05.1917). Son of Charles H. Norris and Gertrude Norris. Married (1924) Violet Cremer (died 1987); one son. Education: RN Colleges, Osborne & Dartmouth; Cambridge University (1919). Director of the British Productivity Council, 1957-65. Son of Hugh Littleton Norris and Mabel Grace Stephenson. Married (1930) Nancy Anderson; three sons. Lived at East Farleigh House, Maidstone. Son of late Col Roger North, Royal Artillery. Married 1st (1909) Eglantine (died 1917), daughter of Hon. William Campbell of Sydney, NSW, Australia; no children. Married 2nd (1923) Eilean, daughter of late Edward Graham, JP, of Forston House, Dorchester; one son, three daughters. CMG 12.06.1919 for "services afloat and in important administrative appointments ashore during the war"
Major 1st Battalion Dorset Home Guard, 1942; a Younger Brother of Trinity House; Naval ADC to Prince of Wales during Canadian Tour, 1919 (MVO); Extra Equerry to Prince of Wales during tours to Australia, India, Japan, Africa and South America (CVO); Extra Equerry-in-Waiting to Duke of Connaught during Indian Tour, 1920-1921; ADC to the King, 1932; Extra Equerry to King George VI; DL Dorset 1952. Son (with two brothers) of Lt.Col. Arthur Cecil Northey (1873-1931), The Cameronians (Scottish Rifles), and Madeline Harriet Owen (1883-1951), of Datchet, Buckinghamshiire. Principal, Civil Service, 1964. First Secretary, Diplomatic Service, 1966. HM's Consul at Johannesburg, 06.05.1967 (reappointed Officer, HM's Diplomatic Service, 07.01.1969 & 11.11.1970). Temporary Yeoman Usher of the Black Rod and Deputy Serjeant-at-Arms during the absence of Group-Captain R. M. B. Duke-Woolley, 1975. Son of Henry J. Notley, and Ethel M. Nolan. Married ((03? ).1945, Lancaster, Lancashire) Helen Rosemary Daniel; two daughters, one son. Son of William James V. Nowell, and Teresa Hale Jutsum.